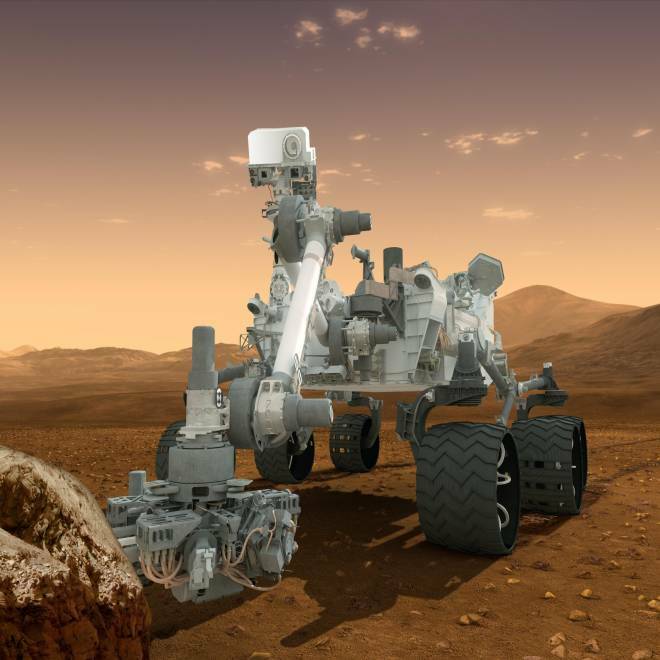 NASA's Curiosity rover, shown in this artist's conception, is equipped to analyze chemicals on Mars. NBC's Brian Williams reports on Curiosity's latest findings. "We have to be very careful to make sure both the carbon and the chlorine are coming from Mars," he told reporters. Caltech's John Grotzinger, the project scientist for Curiosity's mission, seconded that view. "We just simply don't know if they're indigenous to Mars or not," he said. Grotzinger said the team would first have to confirm that the constituents of the organic compounds seen by SAM truly came from Mars. If the presence of organics is confirmed, then the scientists would have to look into whether they are merely part of the "background fall of cosmic material" onto the planet, or arose through chemical processes on Mars itself, he said. It would take a step-by-step process to confirm the presence of truly Martian organic compounds, and reconstruct how those compounds were formed. "Then you have ... to decide whether or not those formation pathways are abiotic, or maybe in the end biologic," Grotzinger said. "So you see there's a complicated decision pathway there, and we have to explore each one systematically." Grotzinger cautioned that there would be no "hallelujah moment" in the search for organic chemicals on Mars. A couple of weeks ago, he was quoted as saying that the data set from Curiosity would be "one for the history books." That led to speculation that an earth-shaking discovery could be revealed at the AGU meeting. NASA later said Grotzinger was referring to the two-year mission as a whole, rather than any specific findings to be announced in the near term. Today, Grotzinger said his original comments were misunderstood. "What I've learned from this is that you have to be careful about what you say, and even more careful about how you say it." he told reporters. "We're doing science at the speed of science [but] we live in a world that's sort of at the pace of Instagrams. The enthusiasm that we had, that I had, that our whole team has about what's going on here ... I think it was just misunderstood." Update for 3:05 p.m. ET: After discussing this report with my friends in the newsroom as well as on Twitter, I've turned the headline around to emphasize the detection of chlorinated methane compounds, even though the origin of those compounds has not yet been confirmed. Is that going too far the other way?